What are your TMF Resolutions? The idea of starting over with the New Year is an attractive one. After a long year, it’s human nature to detour into bad habits or lose sight of the incremental steps necessary to reach an important goal. But what are the resolutions we all have in common? Get Healthy: LMK is all about TMF health. Although metrics are never a one-size-fits-all endeavor, start developing useful metrics by focusing on measurable aspects of the TMF, like Timeliness, Quality, and Completeness. Many of your electronic systems are already gathering the data you need to make measurable changes. Live Life to the Fullest: Although this resolution reads a bit cliché, the sentiment it carries is important. It calls on us to get up off the couch and live proactively. In the spirit of this resolution, we’d like to remind you that you can’t set a TMF on autopilot. If a process isn’t working, it’s time for a redesign! If it’s excessive or inefficient, why do it? Learn New Hobbies: Technology continues to increase its role in the TMF. AT LMK, we always focus on the people behind the TMF first, but those people need the right tools to do their best. The start of a new year is the perfect time to investigate new tools to modernize your TMF. 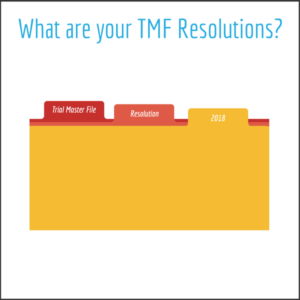 With the right technology, your team can jump-start their TMF resolutions. Spend Less/Save More: Now is the time to consider how your TMF resources are being used. There’s always a limit to the amount of money and time that can be devoted to the TMF. Consider leveraging your TMF health metrics to adopt a risk-based approach for your TMF. By targeting your resources effectively you’ll have more time and money to reach the most important goals.